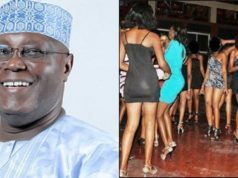 Titi Abubakar, wife of the PDP presidential candidate, Atiku Abubakar, has told women that her husband is not interested in cornering Nigeria’s money because he only wants to serve the nation. “Atiku must rule. Atiku must get Nigeria working again. You know that Atiku is a job creator and he is going to engage most of the unemployed people. “She has told his father that he is not APC or PDP. She said she wants to work for her people, she wants to save lives and that is what she has been doing.